Well, it was recently my mum’s birthday and as tradition now dictates she came to mines, for Sunday dinner. We usually have her birthday dinner on the closest Sunday to the actual day, but as luck would have it, it fell on that day this year. So, I cooked with Disneyboi as my sous chef, and whipped up a gorgeous (even if I do say so myself!) main meal of barbecue pulled pork, smashed potatoes and carrot and pea mash, with Parmesan. But enough of this savoury nonsense! For dessert, and as tradition now also goes, I made a carrot cake, mum’s favourite ‘afters’. Over the years I have made various versions – carrot layer cake, tea cake, cupcakes – but this year it was in the form of a loaf cake. With a thick coating of vanilla cream cheese frosting on top, Disneyboi, the birthday girl and I scoffed a fair portion. But there was still enough left for mum to take a thick slab home! Preheat your oven to 180 oC. Butter a regular sized loaf pan, then coat with flour, tipping out the excess. Leave to the side. In a bowl, whisk together the flour, baking powder, salt, cinnamon and nutmeg and set aside. With an electric mixer, cream together the sugar and butter until light and creamy. Add eggs, one at a time, then add the vanilla extract (I used LittlePod’s Bourbon Vanilla Extract – great flavour). Mix until well blended. Slowly add the flour and mix until just combined and no streaks of flour can be seen. Slowly mix through the grated carrot. Transfer the batter to the prepared loaf pan and pop into the oven for about 40 minutes, or until a toothpick comes out clean, from the centre – you know the drill! Allow the loaf to cool for about 20 minutes and then remove from the pan, using a knife if necessary. Leave to cool completely. To make the frosting, with an electric mixer, beat together the butter and cream cheese, until smooth, then add the vanilla paste. You could use extract, but the paste has the nice wee flecks of vanilla seeds throughout. Slowly add the icing sugar, mixing until incorporated. With an off-set spatula, spread this liberally on top of the cooled loaf. Your carrot loaf cake is now ready to enjoy. The cake is very light and nice 'n' spicy with the cinnamon and nutmeg and vanilla cream cheese frosting is never a bad thing!! I hope yours goes down just as well as ours did. Love ya mum! Delicious - what a fine dessert. Your mother clearly has very good taste. Actually, the pulled pork and accompaniments sounds great too. Maybe I should start up another blog - savourylad?! I really like the look of this! I usually make carrot muffins because I don't like all the nuts and raisins in most traditional carrot cakes. Wish it wasn't so late, I'd make one now! : ) Thanks for another great recipe! Ah happy belated birthday to your mum! what a tasty looking loaf! 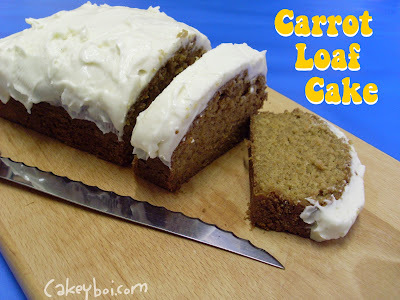 you certainly can't beat carrot cake, I used to love my mom making it when we were growing up...just so I could eat the cream cheese frosting! !